First, let’s start with the staples, these patterns that you see everywhere on the blogosphere. 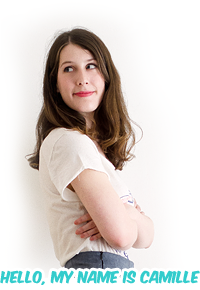 On the indie side, everyone seems to have made the Pauline Alice Cami. 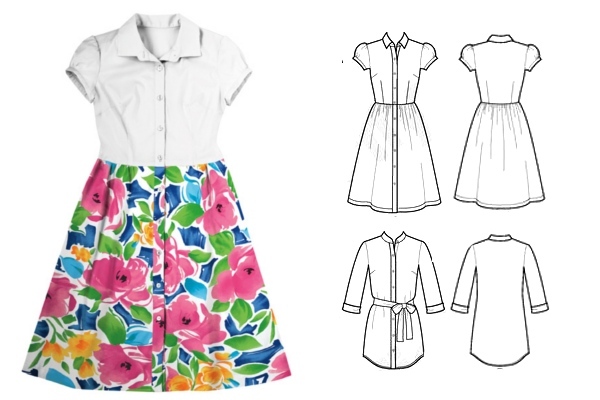 It’s a pretty simple pattern, with a gathered skirt, waist darts, and a classic shirt collar with a collar stand. I have seen a lot of different versions of this dress that I really like, and I have a checkered shirting cotton in my stash that is waiting to get sewn into a Cami. As far as Big 4 patterns go, McCall’s 6696 seems to be the clear winner. Unlike the Cami, whose skirt doesn’t have buttons and that closes with a side zipper, this one has buttons all the way down. Also a waistband, more darts at the bust, pleats instead of gathers for the skirt, and a yoke and gathers in the back as well. 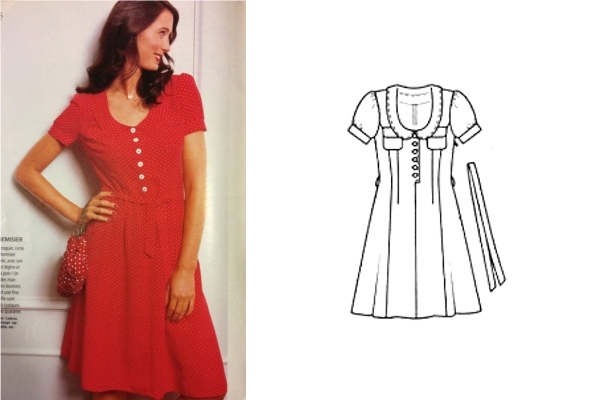 Another popular pattern is Simplicity 2246, by Lisette. 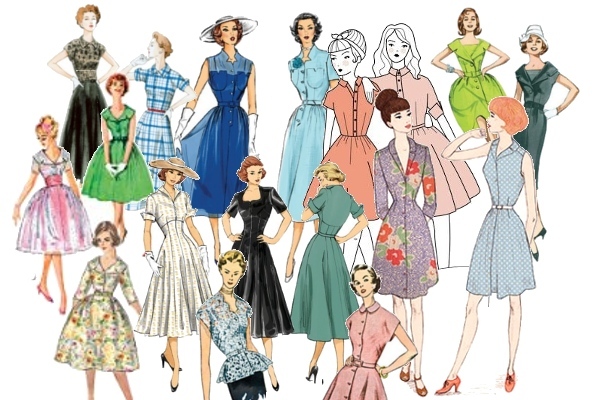 This pattern has several variants for the skirt, collar and sleeves, and it’s no surprise that the ones I like the most are the ones with a waist seam and a flared skirt. The previous three patterns all have a classic shirt collar, with a collar stand. 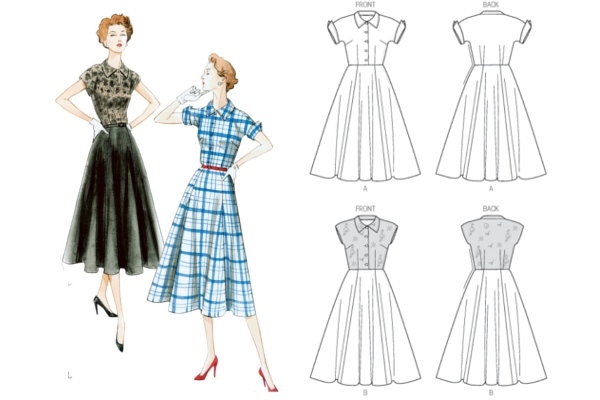 Another style that is popular is the notched collar, such as the one on McCall’s 6891, that also has a circle skirt instead of a pleated or gathered one. 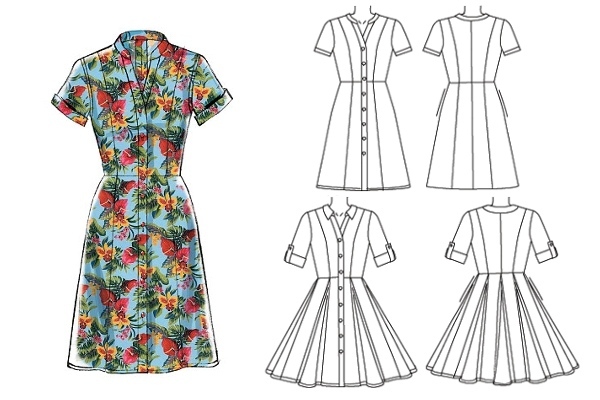 The shirtdress pattern from Gertie’s New Book for Better Sewing looks a lot like the McCall’s pattern from the front, but is different in the back: it has shirring at the waist to be more comfortable, and a yoke in the back as well. 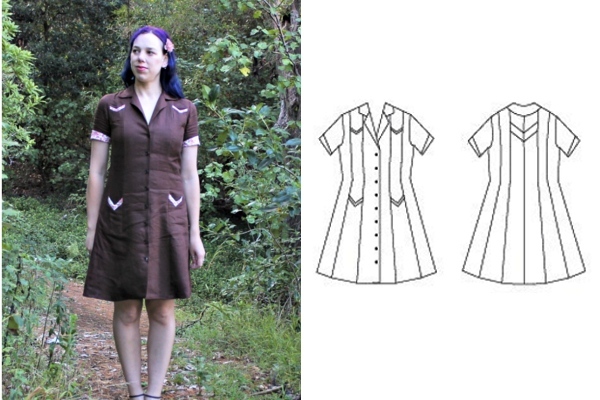 The Vintage Shirtdress from Sew Over It also has a notched collar, but this one is rounder. The skirt has less flare and has darts. The waist darts on the bodice are replaced by a combination of pleats at the waist and gathers at the shoulder yokes. Another, even more retro collar, is the wide lapel one, like on this La Mia Boutique dress I made a few months ago. Dress 4, La Mia Boutique 03/2014, made here! 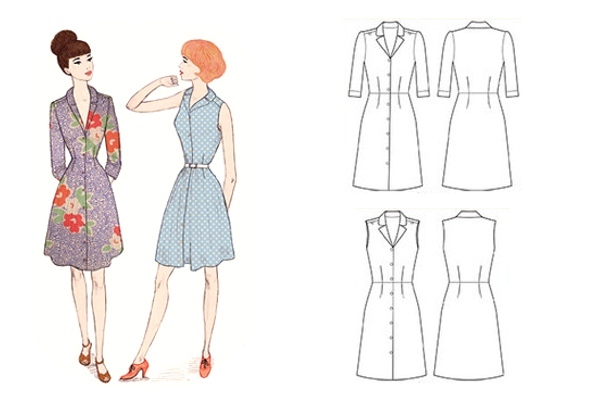 In my collection I also have these two Simplicity and Butterick patterns that look a lot alike. 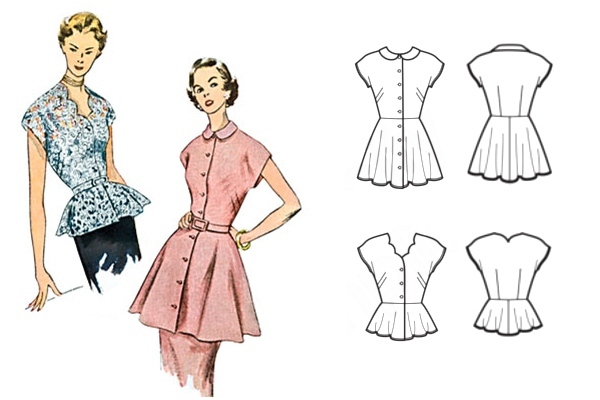 They are both reprints of patterns from the end of the 50s / beginning of the 60s and both have the same very wide collar, that extends up to the shoulder. There are many more possible collar variations. 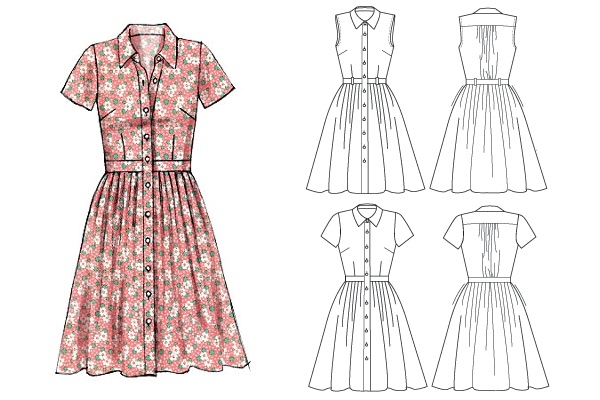 One that I like a lot is the one on the Hawthorn dress by Colette Patterns. McCall’s 7084 has two collar variations: a classic shirt collar and a mandarin collar made from the collar stand piece. McCall’s 7084, made in dotted fabric by Sew Anita and as a wedding dress by Sew Pretty in Pink! 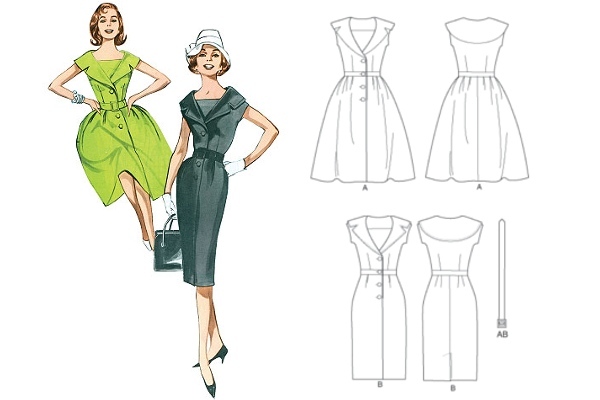 Another possibility is to get rid of the collar altogether, like on this reprint of a 1951 Butterick pattern. Here the raised neckline is simply formed by the bodice pieces. 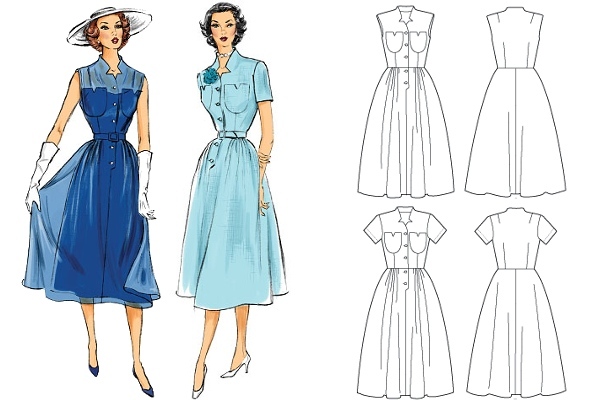 On some patterns, the masculine details that come from men’s shirts are replaced by more “feminine” elements: rounder shapes, puff sleeves, bows… One of my favorites is the Bleuet dress by Deer&Doe. I made one a couple years ago, but I rarely wear it because the fabric is not great and the seam finishes are even worse. I’d like to make another one in a better fabric, with maybe some extra length in the skirt. 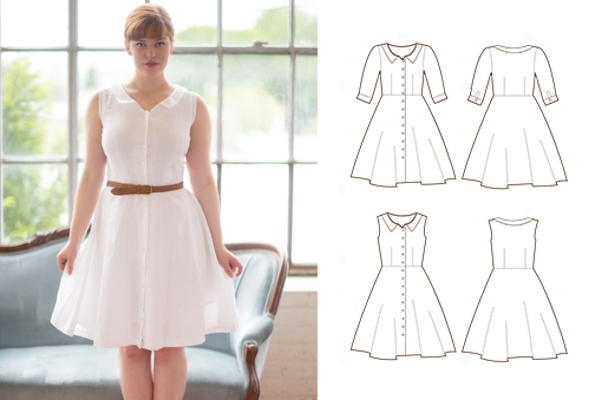 The Clara dress by Sew Liberated also has puff sleeves but those also have a biais-bound opening that I like a lot, and a flat collar on a lower neckline. I’ve had it in my list for a while but I have yet to find a fabric that inspires me to actually sew it. 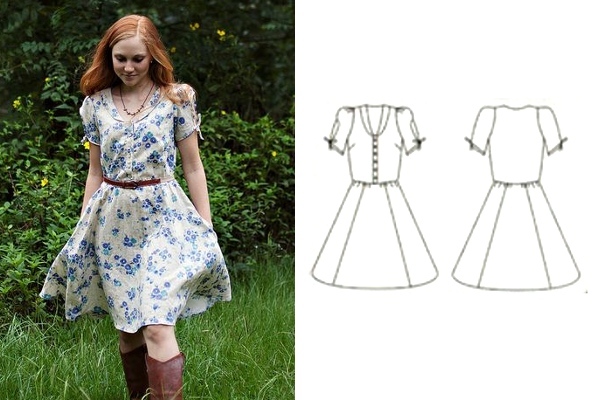 I’ve also just found out about the Melissa dress by Muse Patterns. I have never sewn with this brand before, but the pattern was in the Sew Indie Month bundle (that is only available until Wednesday!) and even though I wasn’t taken with the pattern pictures at first, after seeing a few versions of this pattern online I’m really liking the V-shaped pockets edges. 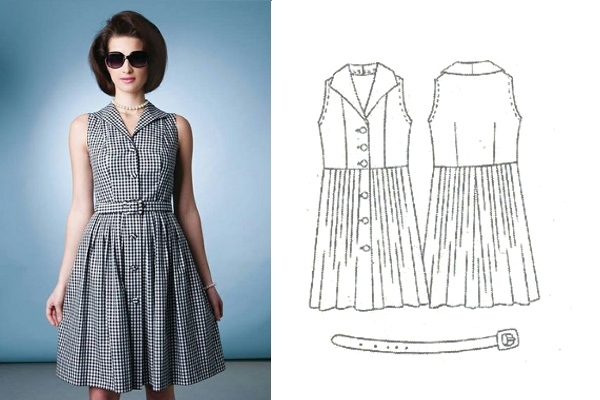 Another pattern that reminds me of the forties is the Ceylon dress by Colette Patterns, one of their older ones. The number of buttonholes is a bit scary, but the neckline shape is unique. Another detail I like a lot is the pointy cuffs of these two patterns, Butterick 6018 and Vogue 9000. 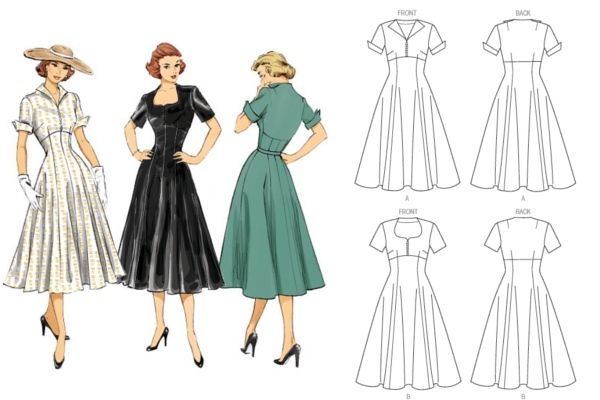 They are vintage reprints as well, the Butterick is originally from 1952 and the Vogue from 1951. I’m especially intrigued by these two as I haven’t seen them sewn online yet. 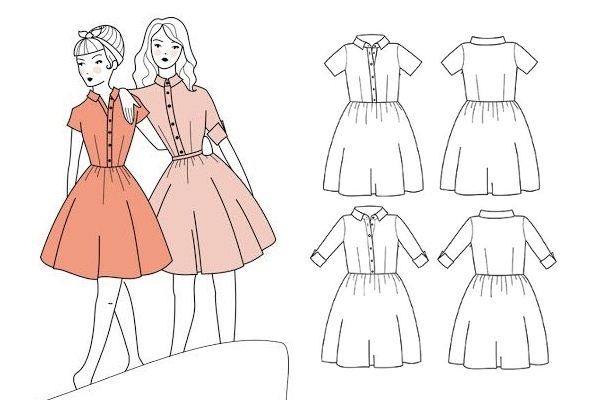 If none of these options appeal to you, there is still some hope: turning an existing regular shirt pattern into a shirtdress. 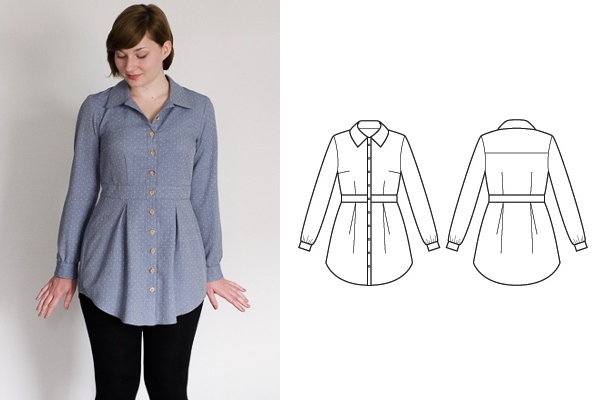 A good example if the Bruyère shirt from Deer&Doe : the skirt panels can be lenghtened, or swapped for a gathered or pleated skirt. 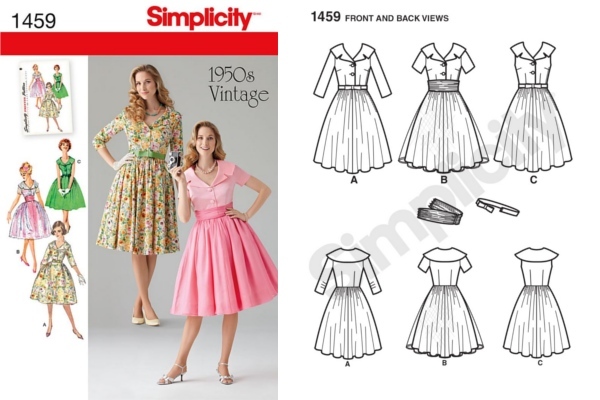 Simplicity 1460 is also a good contender, as it already has a peplum that can simply be lenghtened to form a skirt. Alright, well that should be plenty of options! Seeing anything you like? 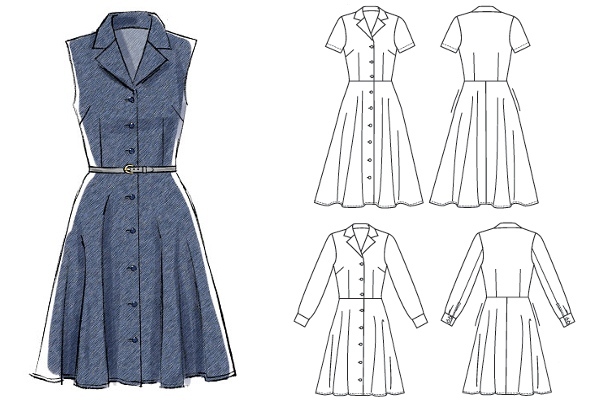 Do you have any other shirtdress patterns you’d recommend? 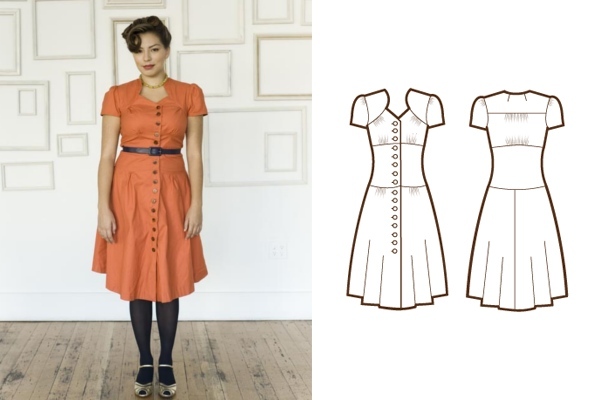 The Lisette dress was one of the first patterns I ever sewed! Very ambitious at the time. 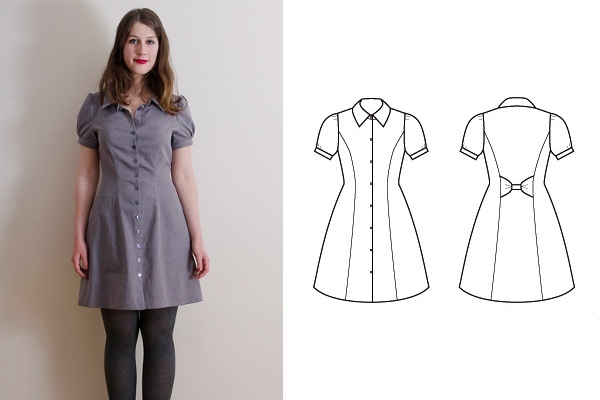 I also love the Burda Prairie Shirt Dress…http://www.burdastyle.com/pattern_store/patterns/prairie-shirt-dress-042011. I have one in plaid flannel and one in dotted chambray (both without the suggested frayed seams), but I would love to make one in a very light material like the picture. Ooo!! 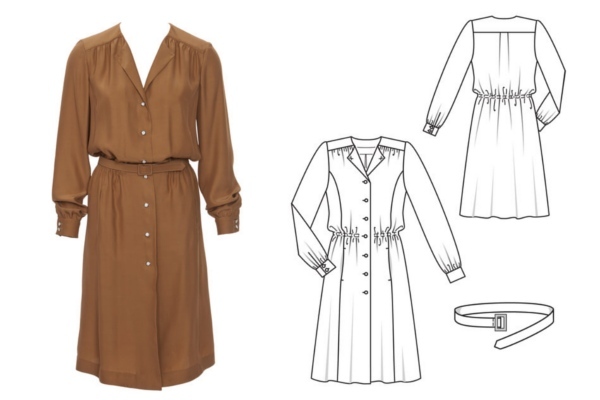 Lots of lovely shirtdress inspiration! 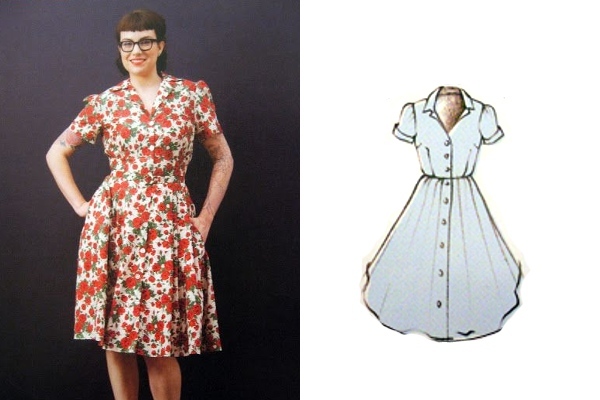 I’ve been on a shirtdress kick lately too, and can recommend Hawthorn, McCall’s 6696 and Sew Over It Vintage Shirtdress. I really like the very first one which is Cami. I think it’s the cuffs on the longer sleeves that caught my eye. This is a fantastic post! You really did a lot of work putting it together 🙂 I have a couple of these but have only made the grainline Archer. I really like the Cami and the Clara because they only button down half way LOL – thanks again for the awesome resource! Ohhh, what a great post – thanks for this – I have quite a few of these, but found a couple i really like that I don’t have.